Burns Monument, and the movement that created it, was in many senses ahead of its time. 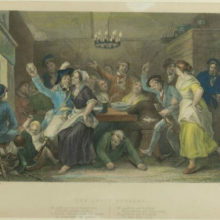 But now the building that has come to define how we remember Burns in Alloway needs our help. 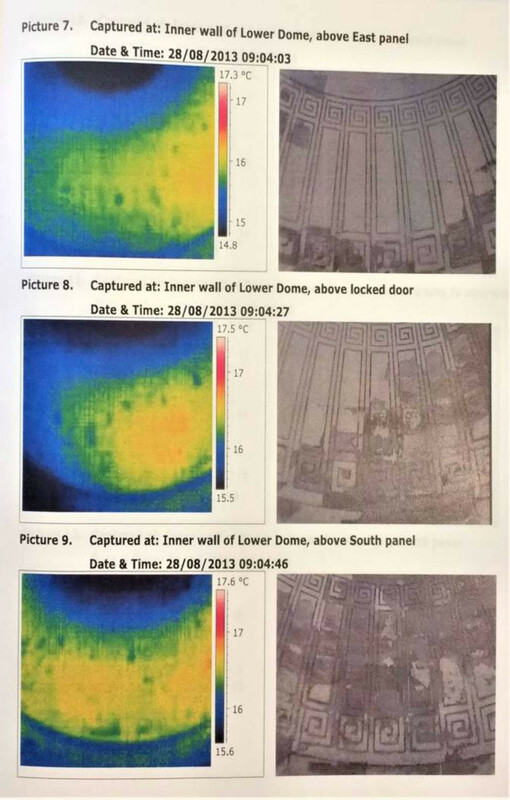 Infra-red images show the extent of the damp in the cupola. Although Burns Monument Trust maintained it well, they had failed to arrest water penetration problems evident inside and outside the building. 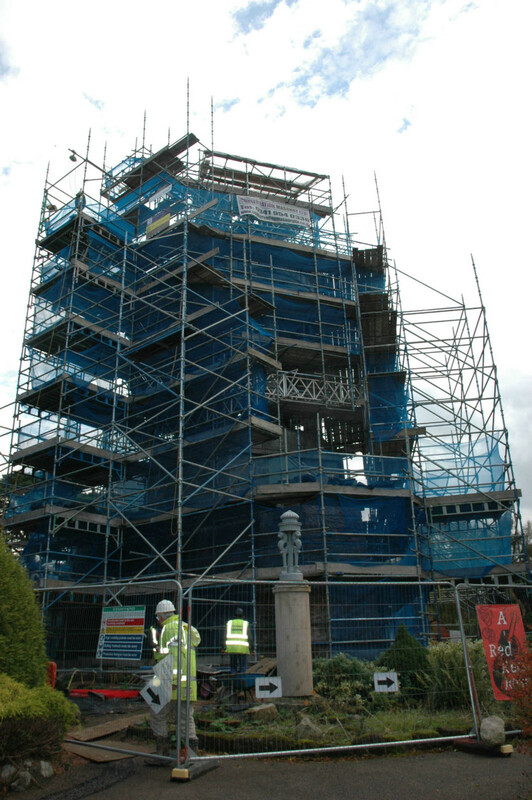 Over the past few years, a conservation project (funded in part by The Foundation’s 2014 appeal) has been examining how to address serious problems with the fabric of Burns Monument. Linseed oil is an organic compound and therefore not stable over many decades. This is thought to be the main reason why there are now gaps between the stones. The repair strategy is to fill all open joints and voids with lime mortar, fix the cracked masonry, reinstate lost features and make other repairs to prevent further water ingress. 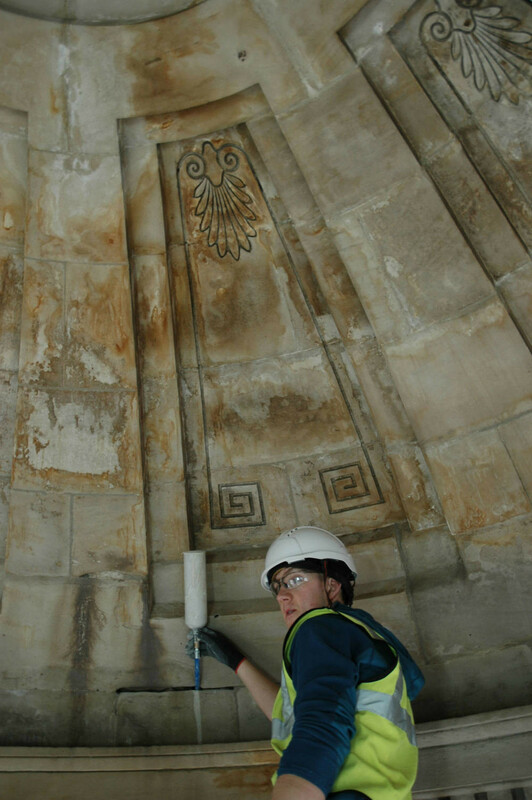 The masonry paint in the main chamber of the monument will be removed to allow the structure to ‘breathe’, leadwork will be replaced, the cupola reglazed, the iconic tripod re-gilted, and drainage refurbished to ensure water run off. Discreet background heating will also help drive water out of the building over a long period of time, which we’ll monitor throughout the project and beyond. There’ll be subtle new interpretation installed inside the monument, delivered primarily using audio. Filling the joints inside the cupola of Burns Monument. To ensure the open joints and voids are fully filled with the lime grout, we’ve developed bespoke equipment for this project. Every joint is affected – this is grouting on an ‘industrial’ scale. We’ve appointed a specialist mortar consultant and worked with the Trust’s own stonemasonry team at Culzean to test the new equipment, refine the technique and practice repeatedly. Once the grout has filled the joints and voids, it’s irreversible. However, lime grout is another form of lime mortar and will enable the building to shed water as it was originally designed to do (and evidently did well for over a century). The equipment and materials have to be suitable for this project as well as having skilled and committed stonemasons on the job. John Crawford and Karen Gemmell are among 12 young people who’ve trained and qualified as stonemasons at Culzean Castle. They’ve supported the grouting trials from start to finish and have become experts in the technique. Historic Environment Scotland grant-funded the research and development stages of the project as the new grouting method was developed – this will transform how other traditional ashlar buildings are repaired in the future. Monitoring of moisture levels in the building fabric is set to continue for a number of years, so we can check that the building is drying out and that the work has been successful. A possible phase two may involve the reinstatement of iron railings and a low wall that once encircled the monument, as well as the installation of an unobtrusive ramp to the entrance to make the monument accessible to all. This is subject to fundraising which, like the movement to build Burns Monument, will be open to everyone, something of which the gentlemen who created this astonishing tribute to Burns over 200 years ago would surely approve. Burns Monument during conservation work in 2018. Learn more about the history and design of the Burns Monument in parts I and II of the Secrets of a Shrine series.